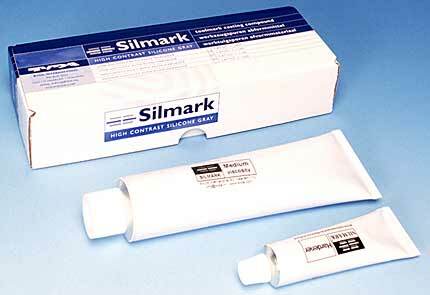 SILMARK is a gray or brown-colored silicone rubber casting material. With the high concentration of pigments in the material, even the strong lighting under a microscope cannot penetrate and reflect from particles beneath the surface of the cast, and optimum sharpness of the microscopic image is thus guaranteed. The gray color has the advantage of providing an excellent contrast when photographing and digitally storing the casted toolmarks. For more information on gray-colored SILMARK see this page. Brown-colored SILMARK is found on another page. For prices and ordering see this page for gray and this page for brown SILMARK.